Spain is a country that wears its history on its sleeve. A visit to just about anywhere in this extraordinary country will bring you into contact with its long and frequently brutal history. Nowhere is that more true than the parched and often desolate landscapes of Extremadura. Historically it was one of the poorest regions of Spain, its inhabitants forced to scrape a living from poor soils. 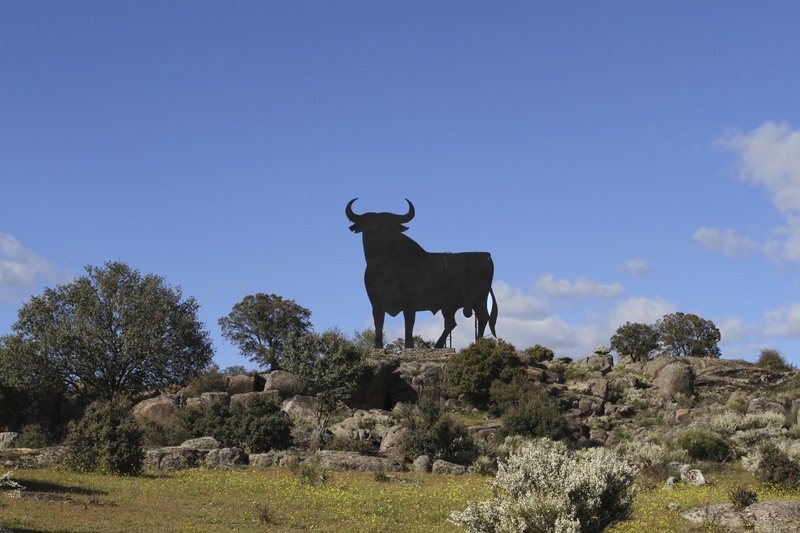 Only now is it starting to shake off a dusty exterior that has kept it off the tourist trail: the historic glories of Extremadura have begun to attract a steady flow of visitors. Life was so hard here that it proved a fertile recruiting ground for the Conquistadors, men like Hernán Cortés and Francisco Pizarro, who would conquer the Americas with a mixture of savage brutality and European diseases. It is Pizarro that most fascinates me. We’d visited Peru twice when living in Bolivia and I’d seen the results of Pizarro’s work at first hand. I was eager to see the town where the conqueror of the Incan Empire grew up. Heading north past Cordoba, we called at tiny Belmez, our final stop in Andalusia before crossing into Extremadura. We hadn’t planned to visit Belmez, but it seemed as good a place as any to grab a coffee and a snack; plus we could see the town’s castle perched on top of a ridiculously steep hill from miles away, and I can’t resist a good castle. We finally found our way through the narrow streets to the base of the hill and started the ascent upwards. Needless to say the castle started life as a Moorish fort, but what remains today dates from after the Reconquista. The climb was worth it. Clambering up to the very top of the tower provided a 360̊ panorama over the surrounding countryside, with only a few birds and a strong breeze for company. Back at ground level we went for a stroll around town, ten minutes later we were seated in the local bar with a coffee. This tiny place looks like it has seen better times, at least judging by the number of ‘For Sale’ signs dotted around the town. There was time when Romans lived here and mined iron ore, but it was the discovery of coal deposits that turned this into a mining region, and saw an influx into the area at the start of the 20th Century. On the outskirts of town the remains of long abandoned coal mines litter the landscape; this area has suffered more than most from economic decline, with industry gone there is little to offset the hardship and younger people are voting with their feet. Back on the road we decided to take smaller roads through the countryside. 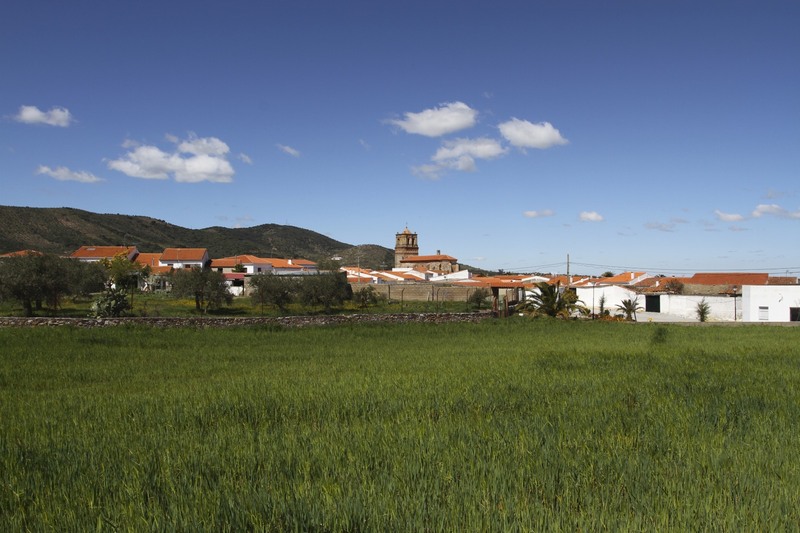 It wasn’t long before we found ourselves passing through breathtaking rural landscapes and entering Extremadura. In the distance we saw what looked like a massive hilltop fortress. Naturally we headed in that direction and after navigating our way through a tiny village and up a steep hill found ourselves, alone and on top of another hill, standing amongst the ruins of the Alcazaba Arabe de Reina, close to the small town of Reina. Situated at a vital junction on the route between Cordoba and Merida, the Alcazaba Arabe de Reina dates back to Roman times, and the ruins of the Roman town, Regina Turdulorum, are nearby on the plain below. It grew into a massive fortress during Moorish times – being situated not that far from the boundary between the Christian north and Moorish south. It may be dramatically situated but there is little that remains of the original citadel other than some of the massive walls. There is a hermitage and shrine in the middle of the fort dedicated to Nuestra Señora de las Nieves, our Lady of the Snows. After wandering around for 20 minutes and drinking in the views, it was time to start the last part of our journey to Trujillo. We skipped visiting the nearby Roman ruins, because some in our party (of two) felt that visiting two castles in one day was already an overindulgence, but this region of Extremadura is definitely one to return to.